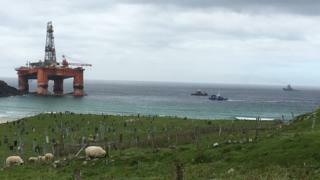 A salvage team will attempt to refloat a 17,000 tonne drilling rig that became grounded on Lewis almost two weeks ago. The Transocean Winner came ashore at Dalmore during a storm while it was being towed from Norway to Malta. The leader of the salvage team confirmed that an attempt to refloat the rig would be made on the high tide at about 22:00 on Monday. Diesel oil has been successfully transferred onto a supply vessel and taken to Stornoway. Since the grounding on the 8 August, a team from Smit Salvage, representatives from Transocean and a range of other experts have moved workers, engineering and shipping resources to Lewis to help with the refloat. Sylvia Tervoort, salvage master with Smit Salvage, said: "We are checking and pressurising the tanks that we'll need for the refloating. Everything is installed ready for use and we're testing each compartment for the attempt at tomorrow's high tide." Ms Tervoort said there was still a possibility that part of the rock on which the rig had grounded could be sticking up inside the pontoon structure below the waterline. She said: "We could have used just one tug, but we have chosen to use two. We are not completely sure about the seabed and the pinnacles sticking in the rig. There are always things in salvage for which you can't account." Hugh Shaw, the Secretary of State's Representative for Maritime Salvage and Intervention, said that salvage teams were still going over calculations and possibilities to ensure the refloat was successful. He said the risk of any pollution from materials on board the rig had been reduced even further since the operation on Saturday. "Transocean have successfully transferred approximately 200 tonnes of diesel onto one of the supply vessels, the Olympic Orion and she's back in Stornoway with that this morning," he said. The towing lines are in place, ready to be picked up by two tugs once the final preparations start on Monday afternoon. Mr Shaw has now given formal permission for the refloat. He said that even if there was a problem with snagging rocks, any further damage to the rig should not pose a problem. "There is only a small amount of diesel left in the tanks because of the way the rig is listing," he said. "But even if there are further breaches of the tanks, it's unlikely we'll see any significant amounts being released into the environment." Once this series of high tides pass, the tide will not reach similar heights for another two weeks at the beginning of September. However, Ms Tervoort said that if unforeseen problems meant that the refloat attempt on Monday was not successful, they were still not out of time with this series of tides. "We still have to go on for the next two high tides," she said. "If we can't refloat this time, there might be different reasons for that and we have to go back and rewrite the plans and try again on the next high tide. "But we are confident that at the next high tide with all the tanks pressurised we can float the rig from the rocks." Mr Shaw said that once the rig was freed it would have to be examined thoroughly to see if repairs were necessary before a decision was taken where to scrap it. It will be towed to Broad Bay on the east coast of Lewis. On Saturday, the salvage team successfully transferred diesel oil on a 17,000-tonne grounded rig from pontoon tanks to a safer position above sea level. The oil was then moved onto the Olympic Orion. Coastguards said no pollution from the oil transfer had been detected. A temporary exclusion zone of 300m (984ft) remains in place around the rig. More than 12,000 gallons (56,000 litres) of diesel oil were lost from two tanks on the Transocean Winner after it came ashore. The fuel is said to have evaporated and not caused a pollution incident. Rig Galore: Could grounded rig inspire arts?